Kalix can automatically add your client's doctor's (or referring provider's) details to documents e.g. doctor's letters via Referrals. To create a referral in Kalix, open the client's file, and via their Cover Page, under the referrals subsection, click on the New Referral link as shown below. Go to the section titled Referral Source. To add your referral source e.g. the referring practitioner, start writing their name in the 'Link Contact' field. A list should be generated containing contacts with similar names, just click on the applicable name to select it. If your referral source is yet to be saved into Kalix as a contact, click on the link 'New Contact' (shown above). You will be redirected to the New Contact screen, enter your referral source's details and save. Once you have created and saved the contact, go back to the New Referral screen. For more information about creating a contact in Kalix click here (U.S.A) or here (rest of the world). Complete the rest of the referral details and click save. For more information about creating a referral in Kalix click here (U.S.A) or here (rest of the world). Next, you may wish to link the referral to the appointment you are creating the document/doctor's letter for. By doing this, Kalix will auto add the appointment and referral specific info into your document. 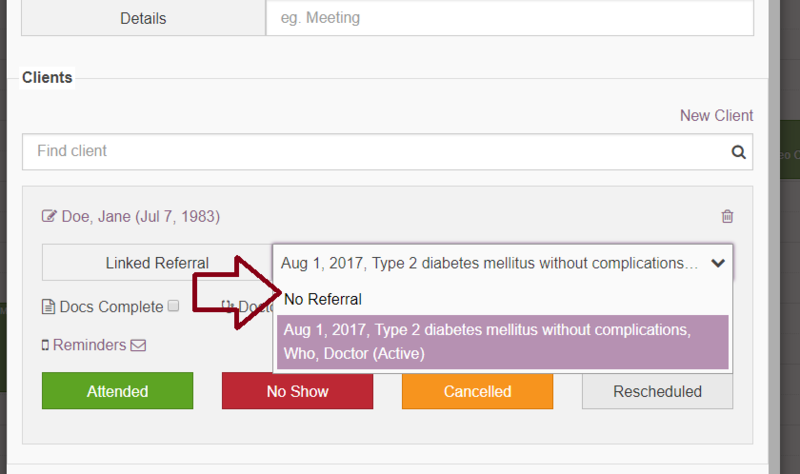 A referral can be linked to an appointment on the New/Edit Appointment screen and the Appointment Details page. If there is a current active referral for a specific client, Kalix will automatically link this referral to the client's appointment as you first create it (via the New Appointment). Kalix will then automatically link the referral to the document. Now Kalix will autofill your document with doctor specific information.